Soothe and protect your skin with the BIODERMA Atoderm Hulle de douche Ultra-nourishing Anti-irritation shower oil 200ml, a deeply hydrating body wash for extremely dry skin types. Formulated to protect your skin's natural barrier, the shower oil protects your skin from external aggressors, whilst gently cleansing an over-sensitised, dry, chapped skin. Made with an exclusive formula of vegetal biolipids that create a defensive barrier over your skin, whilst soothing any tightness, the shower oil has added vitamin PP that creates lipid synthesis to reconstruct the skin's barrier and reveal a calmed, soft touch to your skin. BIODERMA Atoderm Hulle de douche Ultra-nourishing Anti-irritation shower oil 200ml was found on 5 websites and was price compared using EAN: 3401528519895. 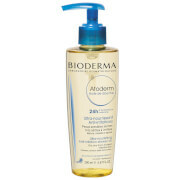 The cheapest BIODERMA Atoderm Hulle de douche Ultra-nourishing Anti-irritation shower oil 200ml is shown as the main item, prices range from £6.00 to £8.80, excluding delivery. Price comparison based on price and delivery charges, with any valid discount codes being applied, is shown in the table above. Prices and information correct at the time of publication.